World of Warcraft FREE Trial! Find out about the new World of Warcraft expansion and more! The little, pink blob gets ready for some four way action in his latest adventure. Great multiplayer support; quality 2D platforming; a couple fun mini-games. Some repetitious backtracking; should support the Wireless Adapter. There was a time when a kidnapped princess was all that you needed to kick off a video game. Nowadays, the hero needs to get magically split into four different colored versions of himself in order to save the day. It happened to Link in The Legend of Zelda: Four Swords, and now it's happened to Kirby. An evil force has invaded Mirror World, which is apparently a suburb of Kirby's home of Dream Land. The force creates "shadow" versions of both Kirby and the series' reoccurring character, Meta Knight. The evil Meta Knight slashes at Kirby with his sword, creating red, green, and yellow duplicates of the pink puffball. With his three new selves, Kirby flies off to save Mirror World. 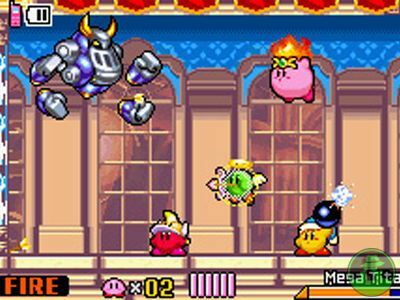 The previous Kirby games have been set up like your typical 2D platformer, with worlds made up of separate levels. The Amazing Mirror breaks that trend by taking place within a world more along the lines of Super Metroid or Castlevania: Symphony of the Night. The action takes place within a large, interconnected world, comprised of different areas. You need to use specific powers to advance to other parts of the map. Four Kirbys are better than one. Quadruple the pleasure; four times the fun. Since this is a Kirby game, those powers come from ingesting enemies to steal their abilities. Many of Kirby's classic skills return, but be on the lookout for a few new techniques. My favorite by far is the "Smash" technique, which gives Kirby all his moves from Super Smash Bros. Melee. In a wonderful bit of fanboy synergy, you acquire Smash by defeating a very special mini-boss, Master Hand, the final boss from Melee. The structure of the world can be extremely confusing at first. As you progress through the stages, you'll come across tons of doors leading off to several other places on the map, and it can feel a bit overwhelming. After a bit of exploration, you'll find maps for the world's various areas that make keeping track of your progress a bit easier. Unfortunately, to explore every area, you're required to backtrack a lot, which gets boring pretty quickly. Even worse is when you travel through a stage only to find that you aren't currently using the required power-up to proceed. Having to exit out to the hub world in order to find the "Burning" ability before returning to where I just was isn't a whole lot of fun.